Inevitably, you will have brown bananas. Ugly, spotty, squishy bananas. You are not even particularly fond of bananas and yet, here there you are, you and ugly bananas, together. You have tried every trick you know, and nothing will make those bananas look better. So here's what you do: you mash the life out of those bananas and you butter them up, egg them on, and share some bourbon. You really show those frickin' bananas what's what and they give you delicious, comforting bread. 1 loaf, probably 12 servings, if you are reasonable. Heat the oven to 350˚F. Butter a standard loaf pan and set aside. Whisk together the flours, soda, spice and salt in a medium bowl. Mash together the bananas and butter - do this in a sealed zip top bag by massaging the mixture on a counter. Empty the bag into a small bowl, add the sugar, egg, vanilla and bourbon and beat until smooth. Add the wet mixture to the dry mixture and mix gently until well combined. Pour into the prepared pan. Bake for 50 minutes to 1 hour until a the loaf springs back in the center. Cool in the pan 10 minutes before devouring. 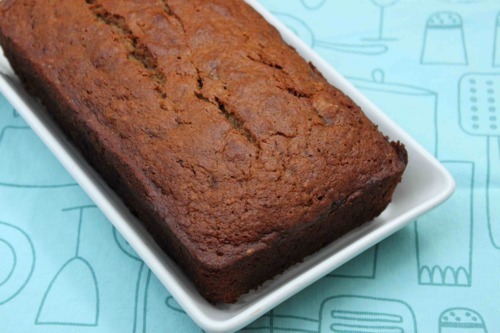 I just made this recipe substituting the 1/2cup whole wheat flour with Rye and the Bourbon with Meyers Rum (because that's what I had) and it turned out SOOOOOO GOOOOOOOOOD!!! Thanks a bunch for this awesome recipe Meghan. I will try it's original version next time. Hey Casey! I'm so glad you enjoyed it - I should try it with rye next time! Banana and rye are likely a lovely pair. And don't worry about making it any other way than your own. My goal is to write recipes that can be riffed on without any problems :).